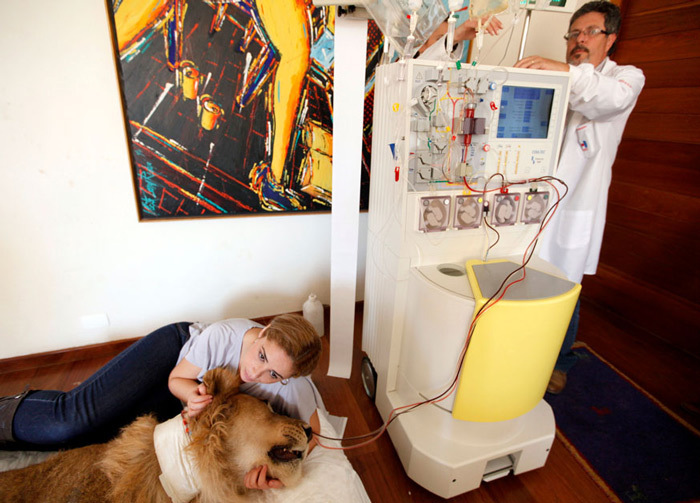 Veterinary physiotherapist Livia Pereira holds the head of paralyzed lion Ariel as a veterinary works on plasma exchange treatment machine in the living room of Pereira's home in Sao Paulo. 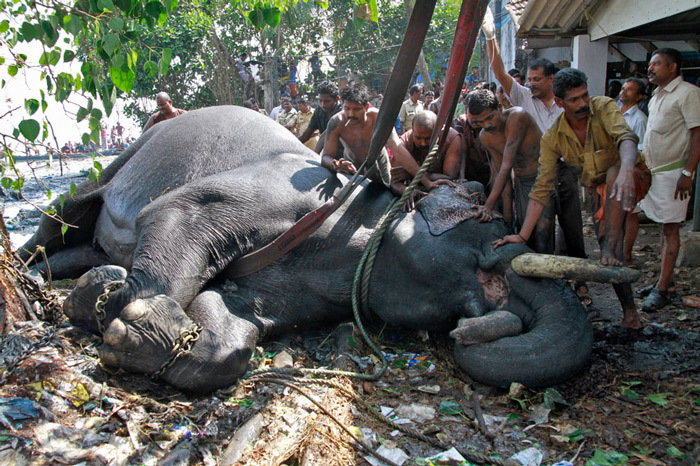 A vet administers glucose to an elephant after it was rescued from a marshland on the banks of the Vembanad Lake, in Kochi. 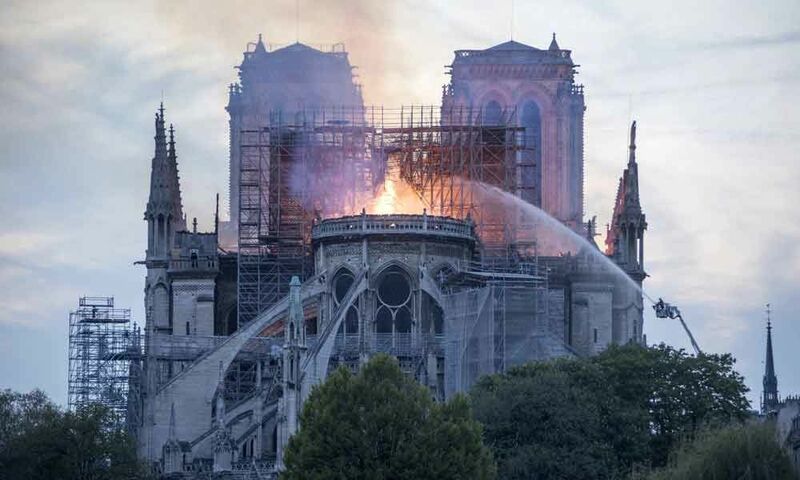 According to the police, the elephant was brought onto the banks of the lake after nearly six hours of a rescue operation. 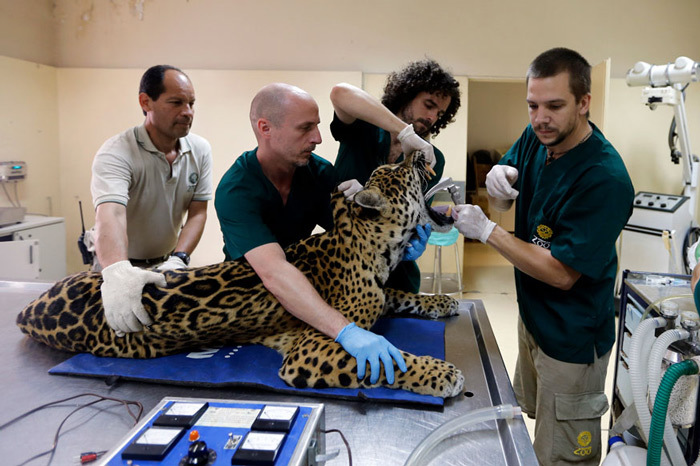 Veterinarians prepare Tango, an eleven-year-old male jaguar, for a full medical examination at the Buenos Aires Zoo. Argentina's rare jaguar was added to Buenos Aires Zoo's DNA bank as conservationists step up efforts to save the big cat species that is on the brink of extinction. 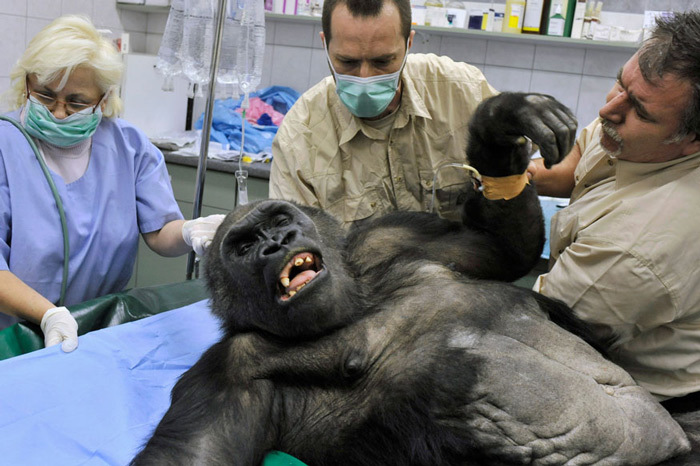 Veterinarians prepare the Budapest Zoo's oldest gorilla, Liesel, for an operation in Budapest. The surgery became necessary due to the progress of a tumour, which could cause the death of the ape. 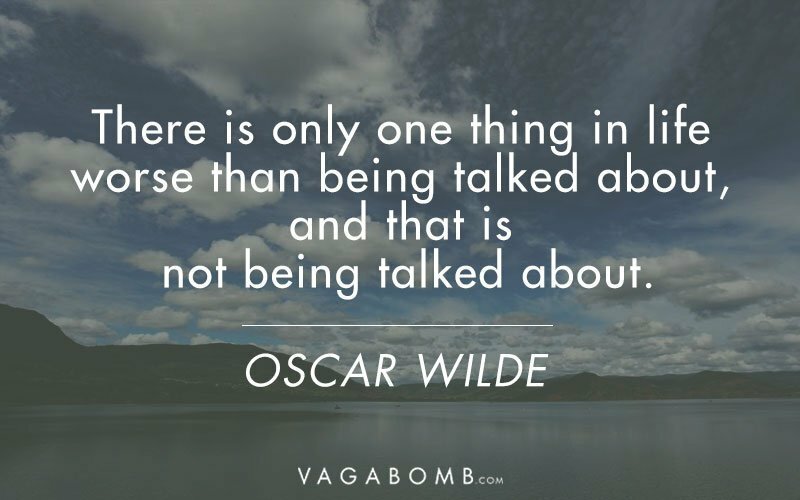 Surgery on gorillas is extremely rare, and this was the first time that this kind of intervention was necessary in Hungary. 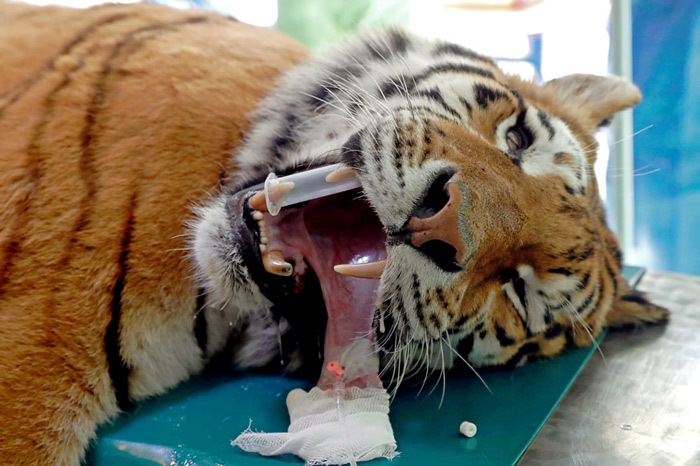 Igor, the 13 year-old Siberian tiger lies on the operation table before the non-invasive stem cell surgery in Zoo Szeged, Hungary. 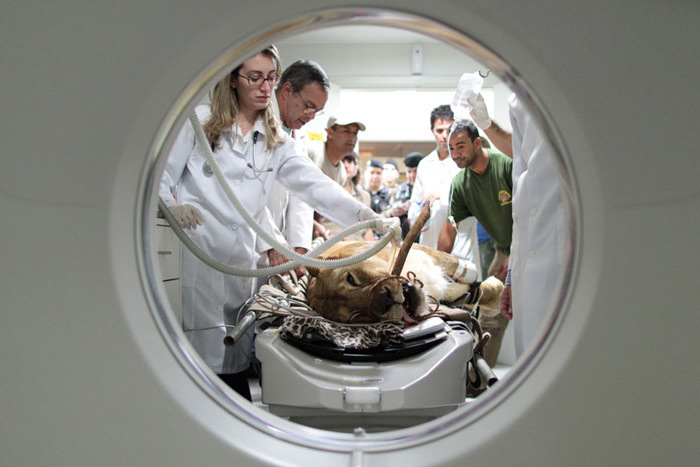 Fafa, a lioness that is nearly 18-year-old, receives a CT scan at the veterinary clinic in Brasilia. Fafa was sedated and brought to the veterinary clinic after experiencing seizures and bleeding. 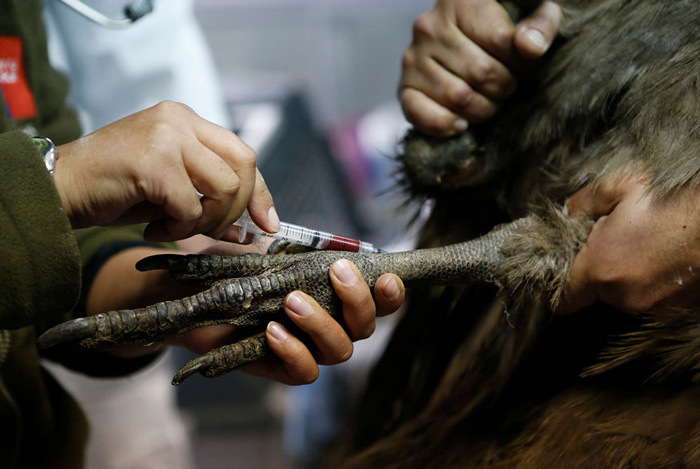 A veterinarian takes a blood sample from an Andean Condor, one of the world's biggest flying birds, at a veterinary hospital in Los Andes. 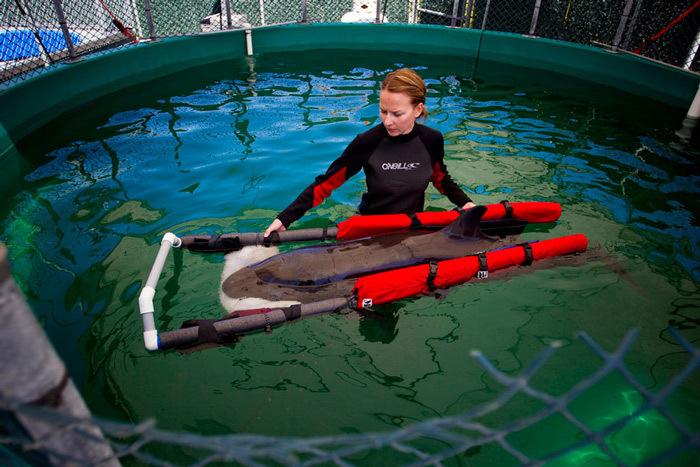 A veterinarian from the Zoological Foundation of El Salvador (FUNZEL) uses a stethoscope on a female dolphin in San Diego. A female and a male dolphin were rescued by local fishermen after they were found beached in two different spots along the coastline. 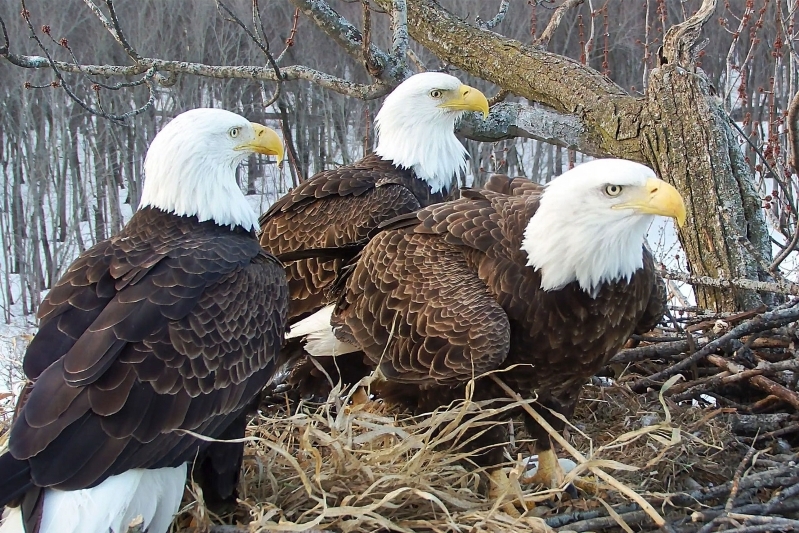 Both animals have scratches and lacerations on their bodies and have been refusing food, according to veterinarians. 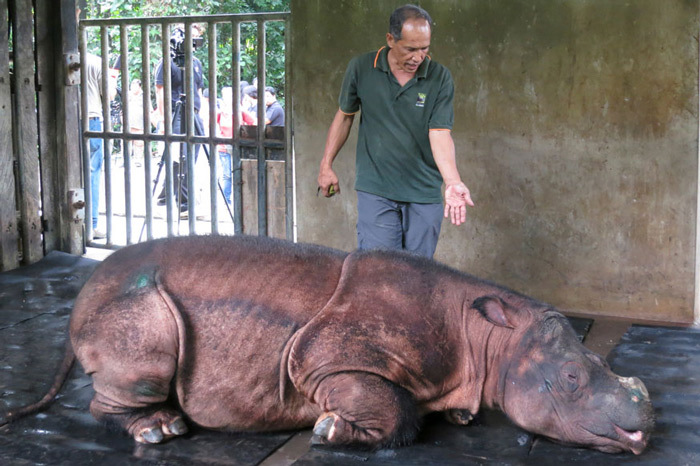 A veterinarian attends to "Puntung", a newly captured female Sumatran Rhinoceros (Dicerorhinus sumatrensis) in Lahad Datu, in Malaysia's state of Sabah on Borneo island. 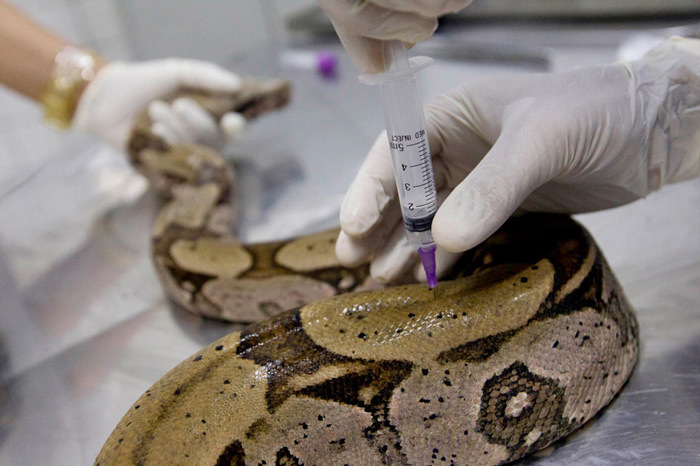 A Brazilian vet applies vaccine in a Boa constrictor at the Sauim Castanheira Wildlife Refuge in Manaus. 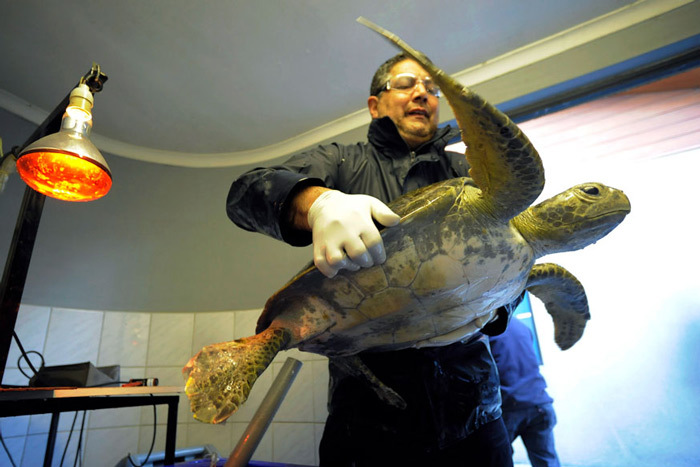 Veterinarian Miguel Angel Mansilla holds up a green sea turtle after it was treated for injuries in Santiago. The turtle was found floating at sea by fishermen and will be released back to the sea on the northern coast of Chile, due to its warm waters, according to Mansilla. 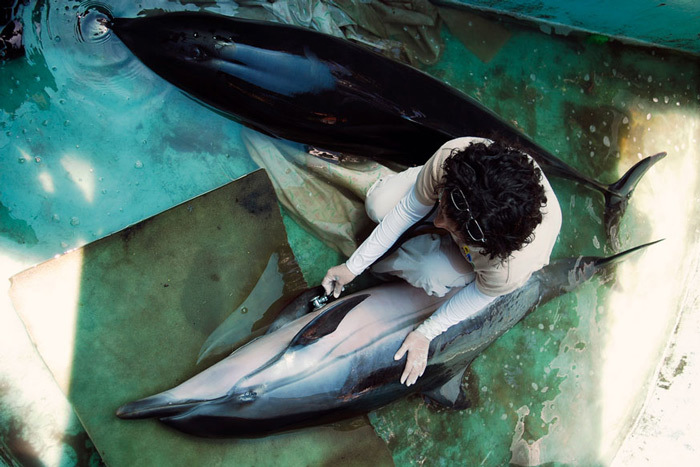 A veterinarian technician Chellan Robinson wades with a false killer whale calf after it was rescued near the shores of Tofino. The rescue team is providing the whale with 24-hour care and has listed its status as hour-to-hour. 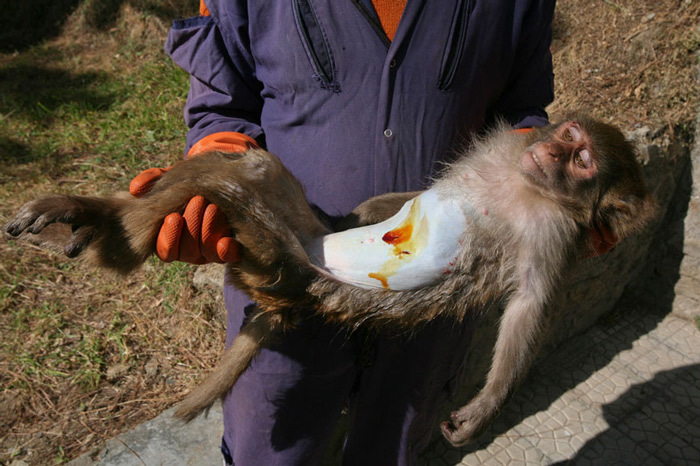 An attendant carries a monkey after its sterilization at a monkey rescue centre run by forest and wildlife department Tutikandi in the northern Indian hill town of Shimla. 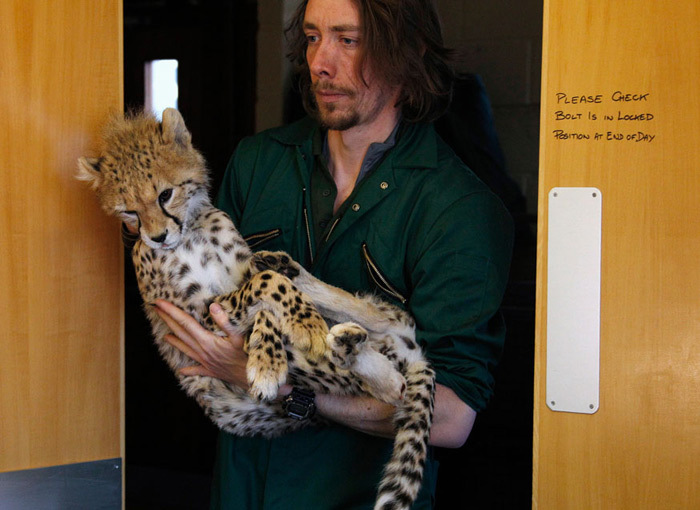 Carnivore keeper Andy Wolfenden carries Juba the Cheetah cub into the operating theatre after being anaesthetized ahead of his operation at Chester Zoo, England. The 9 month old cat was undergoing surgery to insert a metal plate in his right ankle to mend a fracture. 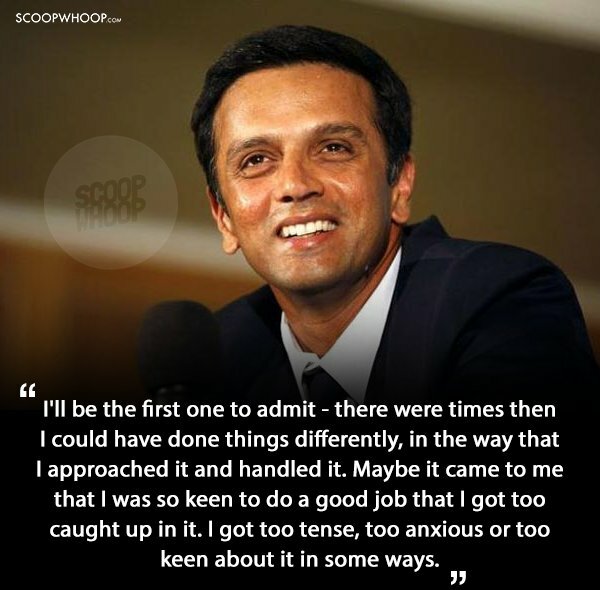 Every day is a day you can be a better person than you were yesterday.